Your heart’s in the right place – you’re developing content, spending time and resources in the hopes of converting your target audience into leads. You may have even allocated budget to PPC campaigns to drive users to your beloved content – but is it delivering ROI? Not only is it possible to expect more from your content, it can be an easy fix that puts your content and your budget under your control. 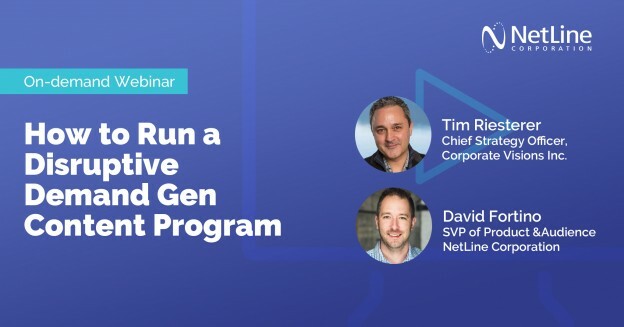 This two-part webinar delves into what type of content is primed to convert, and how to deliver it to the right audience for your lead generation strategy. Our two-part webinar starts with a deeper dive into what makes people tick when it comes to decision making. Rather than perpetuate the existing conversation or affirm the status quo, Tim Riesterer, SVP Sales and Marketing at Corporate Visions, shares the psychological mechanics of driving people to question their current state and seek new alternatives. Part two answers the question: “So once my content is disruptive, how do I put it to work?” Our own David Fortino shares the content syndication strategy that helps amplify audience while using a highly-targeted approach. Translate that to: get your transformative content in front of people who can make and/or influence buying decisions. Tim Riesterer shares his perspective on how people make decisions. He presents a framework for disrupting an individual’s desire to stick with what they know, a.k.a., the status quo. In demand gen, it’s difficult to ask people to take a risk and try something different. 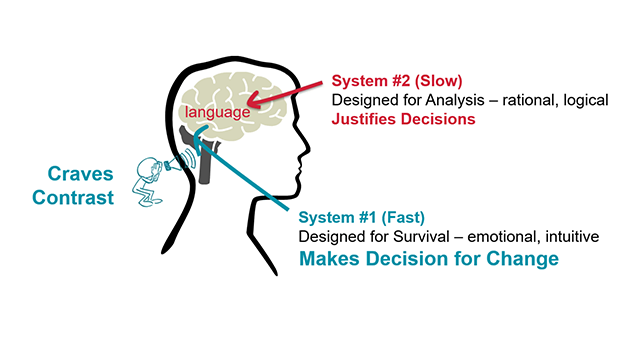 By understanding the psychology of the decision-making process, content can be designed in such a way that defeats the barrier between your organization’s product or service, and the decision maker’s logical approach towards change. Am I safe or unsafe? The emphasis here, is on loss aversion. Tim goes into greater detail on how to develop content that appeals to this process and speaks to their actual decision making process. Why should your audience shift out of their comfort zone? Once you understand the logical and emotional perspective of your audience, content should provide risk and resolution within the framework of a story model. Tim breaks down studies on messaging approaches that deploy the science of loss aversion and defeating status quo bias. Without the fundamental understanding of why and how people make decisions, content is not working hard enough for organizations or the customers they want to reach. 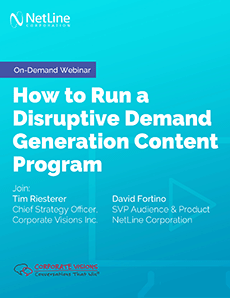 Expanding on these ideas, David Fortino of NetLine Corporation takes the disruptive demand generating content to the next level through discussion of tactics in lead generation. Once the disruptive content is created, how does it get delivered to the right audience? 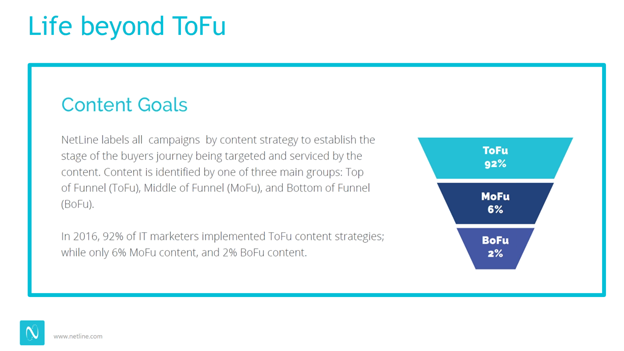 A strong go-to-market strategy is critical, and many organizations are still using top-of-funnel content that does not do enough heavy lifting. Each persona needs a content strategy with a disruptive content plan behind it that taps into the unconsidered needs. Decision-oriented narratives break the mold and stand out from the abundance of “Tofu”. David digs into content consumption patterns and provides insights on how to deploy shiny-new disruptive content to the audience that delivers real ROI. “Beyond the C-suite” implies exactly that – targeting content to the professionals who actually will digest options and influence buying decisions. To get the most out of content distribution, it’s important to discern value from vapor. When it comes to lead gen partners or platforms/networks, look into the underlying pricing model to see if they have any skin in the game. If it’s a CPM model, they don’t. If it’s CPL, they do. Asking non-technical and traditional questions can help reveal what kind of results you can expect and at what cost. Find out how they reach their networks, ask to see sample leads, and scrutinize what the leads look like. If they can’t answer, or if the leads aren’t of the right caliber, reconsider whether or not they’re worthy of your business. Posted by Elizabeth Johnston on February 1, 2018 .